Letter from I.M. Klotz to LP RE: will attend the Protein Substitutes meeting on April 22, 1952. [In Reply to letter from LP March 17, 1952]. [Filed under LP Science: Box 13.004, Folder 4.3]. 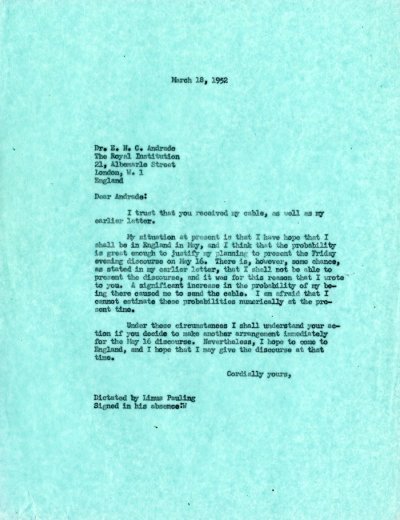 Letter from Joseph S. Fruton to LP RE: will attend the Protein Substitutes meeting on April 22, 1952. [In Reply to letter from LP March 17, 1952]. [Filed under LP Science: Box 13.004, Folder 4.3]. Letter from LP to E.N.C. Andrade, The Royal Institute RE: Includes abstract for planned discourse on protein structure at the Institute.